Master developer Dubai South, billed as the first city in the world centred around the happiness of its residents, on Tuesday unveiled its first two key real estate projects, The Villages and The Pulse at Cityscape Global, at an event at the World Trade Centre Dubai, which will conclude on 8th September. 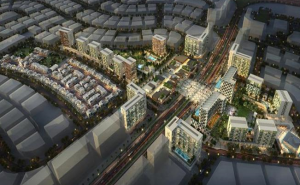 Dubai South is an emerging 145 sq. km city situated within the emirate of Dubai that will ultimately sustain a population of one million. Launched as a Government of Dubai project in 2006, the city is mandated to embody the vision of Vice President and Prime Minister of the UAE and Ruler of Dubai His Highness Sheikh Mohammed bin Rashid Al Maktoum by manifesting the urban and societal themes as outlined in the Dubai Plan 2021. One of the eight key districts of Dubai South, the Residential District is an innovative concept in urban living that aims to create a city that is based on the happiness and well-being of people. Re-imagining urban spaces Dubai South’s master-planned communities will be distinguished by their world-class design, superior build quality, and a wide range of lifestyle amenities. Another unique aspect that makes Dubai South’s Residential District noteworthy is the fact that it addresses key concerns of residents, while providing solutions to the various issues of everyday living, such as walkability, multiple entry and exit points to avoid bottle-neck traffic congestion and ample parking. With an impressive 87 million square feet of real estate being developed at the total estimated cost of AED25 billion, the Residential District at Dubai South is the heart of an integrated dynamic city powering the emirate’s economic growth and bringing to life the fundamental goal of the Dubai Vision 2021. In close proximity to the Al Maktoum International Airport, the largest airport in the world when complete, and the future gateway to the UAE, the location of the Residential District is unique as it also adjoins the Expo 2020 Dubai site, which is expected to welcome 25 million visitors. The pioneering residential communities, The Villages and The Pulse offer all necessary amenities from a retail centre, a sports centre and a community centre, to a school, gas station, hospital, mosque, nursery, mall and hotels, all within easy accessibility and convenient walking distances. Modern, exquisitely designed contemporary real-estate products are set amidst purpose-planned green open spaces and parks. The Pulse, as the name suggests, is a dynamic space, centred on a 70-metre wide, 6-lane boulevard. A novel integrated lifestyle concept, it brings together retail, hospitality, leisure, and all modern requirements of residents within a very urban environment. “The Pulse is one of our exclusive mixed-use projects located in the heart of the Residential District. It will offer studio, 1, 2 and 3 bedroom apartments and 2 and 3 bedroom townhouses within a gated community. Plenty of parking spaces will be available dedicated for the residents and visitors. The community will also have a club house with a gymnasium, pool, children’s playground and a yoga lounge,” Al Ansari added. The three different products being released for sale in The Villages include townhouses, residences and apartments, the products being launched at The Pulse include, The Pulse Residence, The Pulse Boulevard Apartments and The Pulse Townhouses. A convergence of numerous factors make Dubai South a promising real estate investment. “The integrated ecosystem of Dubai South will ultimately provide more than 500,000 jobs and house one million people. All the housing developed in the residential district will ultimately support the large workforce required to deliver an amazing Expo experience. With the expansion of the passenger terminal at the Al Maktoum International Airport, and also the upcoming Expo 2020 Dubai, all roads lead to Dubai South,” Al Ansari said.